Get ready. It will snow. Is the University of Cincinnati open or closed? You can prepare by understanding why the university closes, how the university communicates that it is closed and what you can do to prepare for inclement weather. When inclement weather threatens the safety of the University of Cincinnati community, University Rule 3361: 10-55-01 will be invoked, and an emergency closing will be declared. It is possible that only some campuses of the university may close. 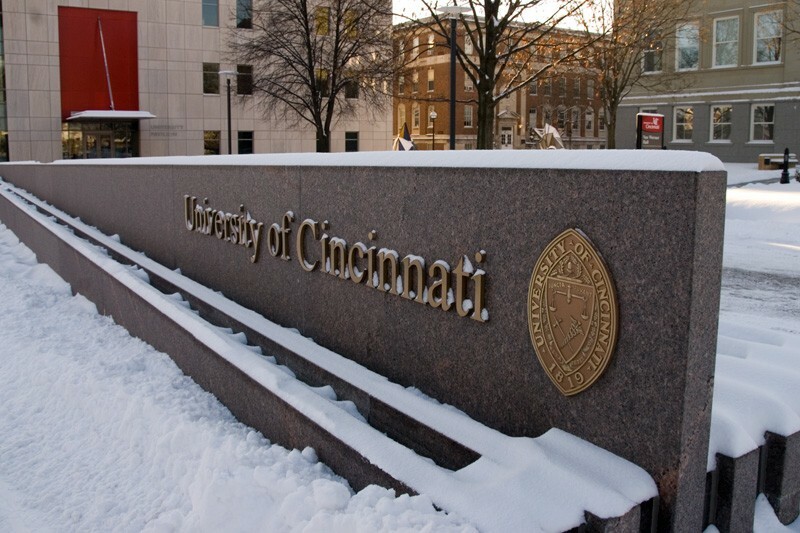 UC's Winter Weather Closure Procedures may call for cancellation when the National Weather Service declares a wind-chill warning (approximately -25 degrees) for an extended period of time during the daily commute or normal university operating hours. The following units (described in University Rule 3361:30-16-01) are never closed, no matter what the status of the rest of the university. Service units that routinely operate on a seven day per week, twenty-four hour per day service schedule. Students at the Academic Health Center should follow their college’s inclement weather plan. University of Cincinnati Medical Center, UC Health, and related patient care units are not affected by this notice. Please visit www.UCHealth.com for information about University of Cincinnati Physicians offices and UC Health hospitals. You'll be able to find important information regarding the status of UC campuses on the UC Alert page. In the event of an emergency or inclement weather, please check this page. You may want to bookmark it for future use. If the closing is announced during the day, it will be communicated via UC’s voice-activated building alarm system. An email will be sent to everyone with an active UC email account. If you forward your email, make sure that forwarded messages get through. An emergency message will be posted to UC’s homepage. The UC Alert page will be updated at http://www.uc.edu/alert. The voicemail message at UC’s main telephone number, 513-556-6000, will be changed to announce the closing. The voicemail message at UC’s campus-status telephone number, 513-556-3333, will be changed to announce the closing. A text message will be sent to everyone who has provided a cell number to the university. The University of Cincinnati offers a text messaging service to alert students, faculty and staff members about any campus closings and other emergencies. You can check if the university has your correct cell phone number via the UC directory. If you are not a UC student, faculty or staff member, you can sign up to receive opt-in emergency text messages via the Bearcat Guardian App. UC social media will carry closing information via Twitter (@uofcincy) and via Facebook. The message will be sent to most Cincinnati news media for broadcast or posting to station Web sites. There will be no change to the homepage, no email or text message, no notice via the media, and the main telephone number will operate as usual. The voicemail message at UC’s campus status telephone number, 513-556-3333, will report that UC is open. Last year, UC’s Facilities Management, the unit responsible for snow removal on campus, worked with UC Sustainability; Planning, Design and Construction; and Meisner and Associates, to update the university’s snow-removal plan. Critical areas, such has accessibility ramps and fire-exit doors, will be cleared first. All primary and secondary pedestrian areas will be cleared as soon as practical after snow events. When needed to aid with snow removal, vendor Brightview will lend assistance to UC’s Grounds Services. As part of the university’s sustainability and environmental stewardship efforts, UC’s Grounds Services’ snow-removal efforts have adopted more eco-friendly methods. Last year, UC began using liquid de-icer before and after snow and ice events. This liquid de-icer helps prevent sodium damage to landscape and lawn areas. Salt usage and the environmental damage it can cause has also been reduced by select, strategic reductions in snow clearance. For instance, select areas like the Braid on Sigma Sigma Commons, will not be cleared (though primary walkways nearby will be). Or, broad portions of very wide staircases will be cleared to make for safe passage vs. complete clearance. Make sure you are following the university’s official twitter and Facebook pages. If you commute, familiarize yourself with bus routes and other alternative transportation. When the snow falls, it may be better to leave the driving to a professional. If you walk to campus, be aware that everyone does not clean sidewalks as well as the UC Facilities team. You may need to use an alternate path. If you are a student, clarify the expectations of your faculty: When are absences excused and not? How can assignments be made up? How will your faculty let you know if they are unable to meet the class? If you are a member of the faculty, give guidance to your students. How will weather affect assignments and deadlines? How will you accommodate snow days? How must students communicate their inability to travel? How will you let students know you are unable to travel? If you are responsible for a university service, how will you notify your clients of your status? If you are responsible for a university event, how will you handle cancellations, refunds and rescheduling? Remember: This is Cincinnati. During the winter, it snows. A little preparation now will help you when the flakes inevitably fall. This September, the University of Cincinnati Public Safety Department is encouraging students, faculty and staff to participate in National Preparedness Month. University of Cincinnati President Pinto expresses condolences to the family and loved ones of Samuel DuBose and thanks to the Community Advisory Council led by Judge John West.